Today we want to talk about hip flexibility and strength, which is a critical part of the conditioning for every athletic activity that usually doesn’t get the attention it deserves. As you have probably noticed, your hips provide most of the amazing power that your lower body can generate for activities such as running, jumping and squatting, so it’s really difficult to exaggerate their importance in building a strong and healthy body. With proper exercise, you can strengthen the muscles that support your hips and increase their range of motion, and the weight room is the perfect place for this. Whether you want to run faster, improve your performance on the field or lift heavier weights – it never hurts to give a little more love to your hips and thighs during regular gym sessions. Especially because neglecting your lower body too often will leave you with weak and tight hip muscles, thereby reducing your mobility and performance and increasing your risk of painful injury. To build the healthiest hips possible, you need to work to improve both their strength and flexibility, and machines won’t help you achieve that. Instead of wasting your time on your gym’s abductor or adductor machine, which are designed to make you feel like you’re doing effective work when in reality they are not even the slightest bit of helpful, you will perform 4 strength exercises that are guaranteed to help you eliminate most weaknesses that have built up in your hips over years of inactivity or poor movement patterns and build real hip strength, power and stability. Check them out in the text below. But first, let’s take a closer look at the antagonistic pair of muscles that cause movement at the hip joint – the hip abductors and the hip adductors. The abductors are comprised of the gluteus medius, gluteus minimus, tensor fascia latae, sartorius and piriformis, all of which are primarily located around your gluteus maximum and on the outside of your thighs. These muscles work to push your hips out and move your legs away from your body’s midline, and as they contract, the other group – the hip adductors – relaxes. The adductor muscles include the adductor magnus, minimus, brevis and longus, which are located around your inner thigh region and are responsible for bringing your legs together, so they contract whenever you need to draw your leg toward your body’s midline. In most people, both of these small muscle groups are relatively weak and susceptible to injury, and they’re a major contributor to back pain. But learning how to properly train them will help you prevent injuries and take your overall lower body strength to a whole new level. Here’s what to do. Every lower body routine should include an appropriate squat variation. 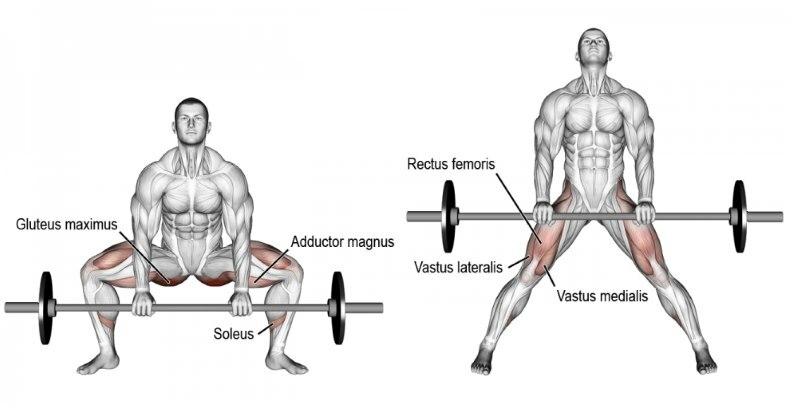 Although all squats are great at targeting almost all muscles below your waist, nothing can emphasize your hips better than the wide-stance deep squat with toes pointed out. In fact, studies have found that performing squats at or below parallel with toes slightly angled outward recruits significantly more abductor fibers compared to shallow squats or squatting with the toes pointed inward. Stand tall with your feet slightly wider than shoulder-width apart, angling your toes outward at 30-50 degrees. Keeping your back flat and core as tight as possible, sit back with your hips and lower your glutes toward the ground. 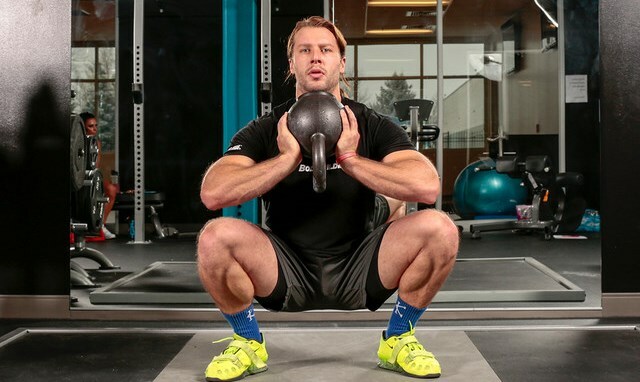 Keep your knees aligned with your toes as you go deeper into the squat. Pause for a second at the bottom, then press through your heels to rise back up to a standing position. Once you master the bodyweight variant, add extra weight in the form of a barbell, dumbbells or kettlebells. The conventional deadlift emphasizes hip extension, making it crucial for developing lower body strength. However, for the goal of targeting your hip abductors and adductors as effectively as possible, you need the help of its powerful twin: the sumo deadlift. For this you will use a foot position similar to the one in a wide-stance squat in order to achieve maximum engagement of the inner and outer thighs. Begin with a bar loaded on the ground. Position your feet very wide with your toes angled outward. As you breathe in, engage your core, press your hips back and lean forward to grip the bar (you can use a pronated, mixed or a hook grip). Bend your knees and lower your glutes toward the ground. Your arms should be directly below your shoulders, inside the legs. As you exhale, drive through your heels, spreading your feet apart and extending your knees and hips as you return to a standing position. As the bar passes your knees, lean back and drive the hips into the bar, squeezing your shoulder blades together and pushing your chest forward. Return the weight to the ground by reversing the movement: first press your hips back, then bend your knees and lower your glutes toward the ground. According to multiple studies, side-lying hip abductions will allow you to activate your gluteus medius and minimus in a way that heavy squats and sumo deadlifts can’t, although the heavy compound moves are way more important for building real strength. Performing only 3 sets of 10 reps should be enough to optimally fatigue these small muscles and improve your ability to recruit them once you’re in an upright position and lifting heavy things off the floor. Lie on your side on a mat with your hips stacked on top of each other and aligned vertically to the floor and feet in neutral position. Bend your lower arm and place it under your head for support, while your upper arm rests upon your upper hip. Keeping your knees straight, engage your core muscles to support your spine and slowly lift your upper leg toward the ceiling without moving your pelvis. Continue raising the leg until the hips begin to tilt and brace yourself with your hands if needed. Hold the top position for a second then return the upper leg to the starting position and repeat. After completing all sets, roll over and repeat with the opposite leg. You’ll finish off with side-lying hip adduction, which primarily targets the adductor longus muscle but also works the adductor minimus and brevis. Lie on your side on a mat with your hips stacked on top of each other, aligned vertically to the floor. Your feet should be stacked in a neutral position. Engage your core muscles and bend your lower arm and place it under your head for support. Keeping your hips stationary, bend your top knee and bring your foot toward your hips, placing it in front of your bottom leg. Lift your lower leg as high off the floor as you can without allowing your pelvis to move. Hold at the top for a second, then slowly lower the leg back down. After completing all sets, roll over and repeat with the opposite leg. Go through this routine twice per week for 6 weeks and you’ll get overwhelming results that will help you increase your total on the big lifts and keep your sessions injury-free. Don’t forget that your hips don’t lie, so make sure their strength counts!